'Criminal mastermind Artemis Fowl has summoned an elite group of fairies to Iceland. But when he presents his invention to save the world from global warming, he seems different. Something terrible has happened to him. The fairies diagnose Atlantis Complex [that's multiple-personality disorder to you and me] - dabbling in magic has damaged his mind. And now the subterranean city of Atlantis is under attack from vicious robots and nice Artemis cannot fight them. 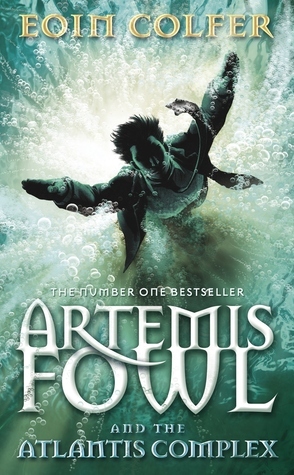 Artemis Fowl and the Atlantis Complex is the seventh and penultimate book in the Artemis Fowl octet written by Eoin Colfer. The reviews of the previous six books are available in this blog (check 'List of Reviews'). In this, Artemis Fowl has invented with a device to save the world from global warming and invites an elite group of fairies to Iceland, to present his device. 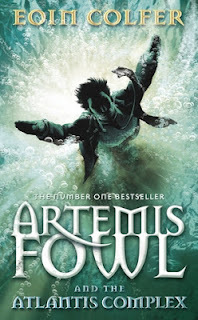 However, disaster strikes, Artemis Fowl is not being himself as he has been diagnosed with Atlantis Complex; symptoms of which are that he doesn't trust anyone, including Butler, starts counting numbers and is obsessed with the number five. Added to that, they come under attack from dangerous amorphobots, designed by Foaly, reprogrammed by someone else into devastating killing machines. To top it all, there is no Butler to protect them, Artemis is crazy and his alternative personality is just a crazy teenager madly in love with Holly. For a start, this book's humour element was higher than the other books in the series owing to the fact that all along, it was only Mulch, who was the comical relief but now there is Orion Fowl, Artemis' alternative personality (although, Orion is just crazy, and not witty like Mulch). But for that, this book was disappointing. The plot was dull, had no content and the language of the author has had a clear deterioration over the years which is getting more and more colloquial. Despite this being my second reading of the same, it still took a long time and sometimes, this book lulled me to sleep in no time. I see this book as nothing more than a filler just to elongate the series and I hope, the finale is not as disappointing as this. I'd rate this book a poor four on ten.